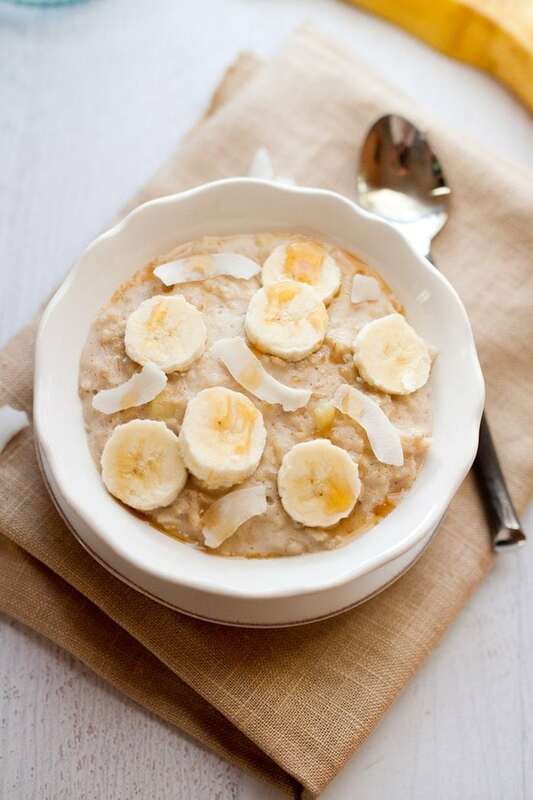 A creamy bowl of oats with tropical flavors from banana and coconut. Nothing warms me up like a bowl of oatmeal on a cold morning especially if it involves flavors that make me think of white sand, suntan lotion and piña coladas. 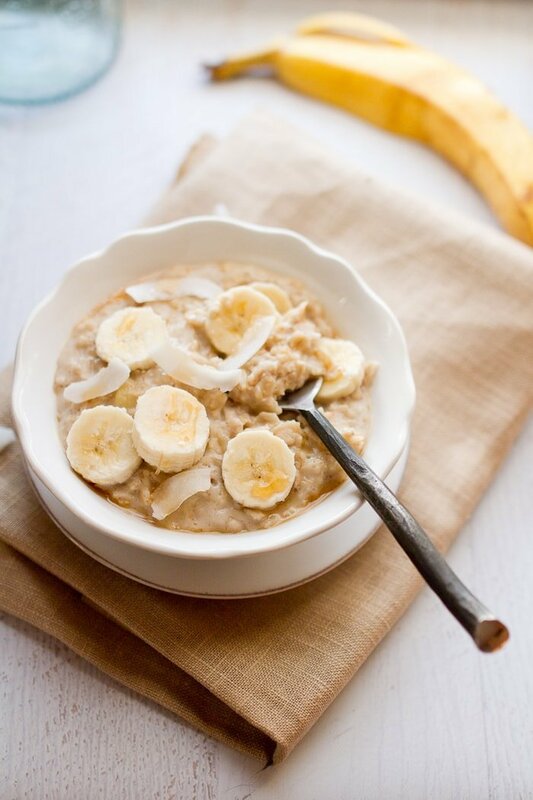 This bowl of oatmeal does just that with flavors of both banana and coconut. It’s delightful… and now one of my favorite oatmeal variations. The star ingredient is this Almondmilk Coconutmilk Blend. I have a slight obsession with the regular unsweetened vanilla almond milk so when I saw this new version at Kroger (on sale nonetheless) I had to buy it! I like it because it’s unsweetened and has pretty much the same nutritional facts as their unsweetened vanilla almond milk — low calories, 50% more calcium than regular milk and no sugar! Plus it’s soy and gluten-free!! So if you’re in the mood for a tasty bowl of oats that will have you daydreaming about exotic islands give this little combo a shot. If you can’t find the almond/coconut milk blend, you could always use half almond milk and half coconut milk. The first time I made this I used a little stevia to sweeten it up, but left it out the second time. 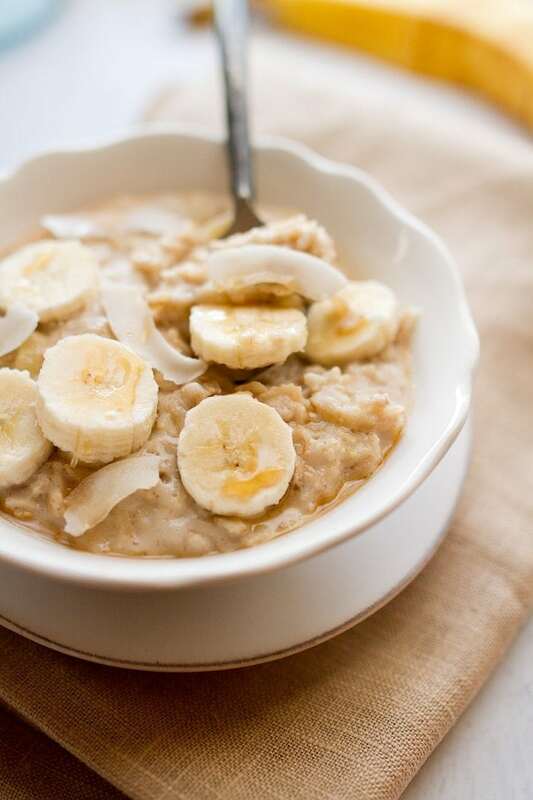 I’ve found that the oats don’t really need any extra sweetness — a ripe banana will do the trick! 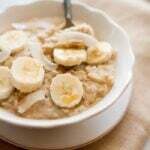 Put oatmeal, milk, banana slices, cinnamon and vanilla in a medium sized pot. Cook on medium-low heat for about 6-7 minutes, stirring occasionally so the oats don’t stick. Banana slices should cook down and become creamy. Remove from pot, top with extra banana slices, coconut flakes and a drizzle of maple syrup. * If you can’t find the almond coconut milk blend use almond milk, coconut milk or a mixture of both. With all this talk about tropical flavors I’m ready to book a trip somewhere warm and sunny. Instead I’m heading in to work. Have a great day! Glad you found it, Brittany! I love using it in my oatmeal, too! I keep looking for the almond coconut milk at my grocery store but they don’t carry it! My husband and I are talking about planning a trip – this might motivate me to get a move on! Yum! I love pina coladas and have been dreaming of the beach since Christmas! I hope my Kroger has the coconut/almond milk blend. I love that it’s a almond coconut blend. I’m still not too sure if I like just plain coconut milk. The oats look delicious! Hi Sophie! Thanks for your comment. 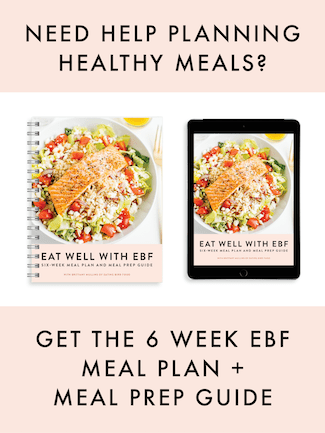 I’m glad you found EBF and have been enjoying the oatmeal recipes. I hope you like this one as well. Let me know if you make it Jasper. I’m sure you’ll love it! Oh my gosh I want that milk! I’ll have to watch for it in my grocery store next time! I had no idea they made a coconut/almond milk blend! I definitely would like to give this a try! I just posted about that coconut/almond milk on Wednesday! The flavor is amazing, especially if you are a fan of coconut, but I, for some reason, don’t like it as much in my cereal. I have not, however, tried it in oatmeal….I also kind of like the idea of using it in a curry…maybe? Ahh.. I like the idea of a coconut curry as well!! Might have to try that. I’m super excited to meet you on Monday. It’s going to be a fun cooking class with all us bloggers!! I cannot wait to try this milk! I always go back and forth at the store between the coconut milk and almond milk, then I buy both. This may stop the constant struggle! I recently started adding shredded coconut to my greek yogurt – it’s so delicious! I bought this but haven’t tried it yet. Can’t wait because now I have a good reason. 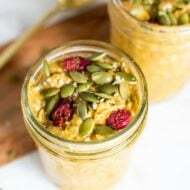 Must try this oatmeal recipe soon! I love the new flavor of almond milk, just tried it last week!! 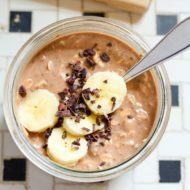 It’s great in breakfast oats and smoothies!! hi brittany! those oats like FABULOUS! i had seen this milk in the store but was weary…now i really want to buy it! 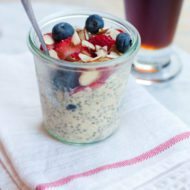 do you think you could do this recipe as overnight oats too? i just picked some of this up too! Your oatmeal concoction looks delicious! I haven’t seen that particular flavor yet, but I’m certainly going to be on the lookout for it! OMG..I can’t wait to find that Almond/Coconut Blend. XOXO, so much love to you! I have to thank you SO much for introducing me to…cooked oats basically. I never used to cook oats because I didn’t think it necessary, I would just eat them plain with (organic) milk and some cranberry-nut mix. I still think that combo is divine but I am enjoying the warmths of cooked oats for winter. I make mine with a blend of coconut milk and water, then toss some coconut rasps in there. You guys in the US are so lucky, you seem to have a much better choice of health-food/good-for-you options available, despite being the country of fast food. In Germany, I wouldn’t even know where to buy Almond Milk!